WDS Designer Natural Shades, Inc. is fully compliant with all safety guidelines as included in the 2ND PROVISIONAL AMERICAN NATIONAL STANDARD FOR SAFETY OF CORDED WINDOW FASHIONS (ANSI/WCMA A100.1-2010 (PS2)) published by the Window Coverings Manufacturer's Association (WCMA). Among other requirements, the Safety Standards indicate that a cord tension device should be attached to the cord or bead loop. WDS has designed, placed, and ships the tension device so that -- "unless properly installed or altered from the shipping condition with sequential process or tools, it prevents the window covering from operating." When not properly installed, the tension device must "at least partially prevent the lift system from moving the window covering through lowering and raising." 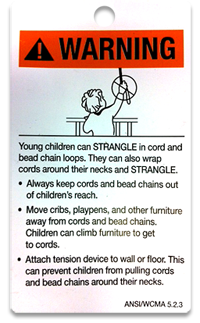 The key feature of the tension device is that it prevents an infant or young child from placing his/her head and appendages through the loose cord. Some people may feel that there are too many warning tags and labels on window coverings. However, these tags and labels are part of the Safety Standards, and they are there to help protect the end consumer. Every installer should know to leave these tags on for the end consumer. 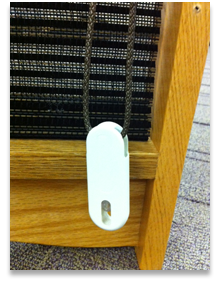 WDS has developed a Safety Shroud that completely secures the rear cords of our woven woods shades. This prevents the rear cords from pulling out and forming a hazardous loop. The safety shrouds are being used on all WDS roman shades (except "motor ready" shades) including Roman and Old Style shades, Duo-Fold and Contour Roman shades. The safety shrouds are sleek and color coordinated to maintain the attractive appearance of WDS products from the street view. WDS Designer Natural Shades tests its shades using equipment compliant with ANSI/ WCMA A100.1-2010 (PS2).